One of Amazon’s most well-known principles is their “true customer obsession.” To achieve the goal of offering customers the greatest possible selection at the lowest prices, Jeff Bezos famously drew inspiration to redesign Amazon’s business model after learning about the ‘Flywheel Effect’, a term coined by strategist advisor Jeff Collins. The Flywheel Effect looks at the interesting phenomenon of compound energy effects created when a flywheel is set in motion. When a flywheel starts spinning, it develops a momentum of its own, making it easy to accelerate faster. Within the business context, the question becomes, how to keep the flywheel spinning only by using its own momentum? Amazon’s flywheel model uses lower prices to attract more customers, which attracts more third-party sellers, which in turn drives greater selection and lower costs. 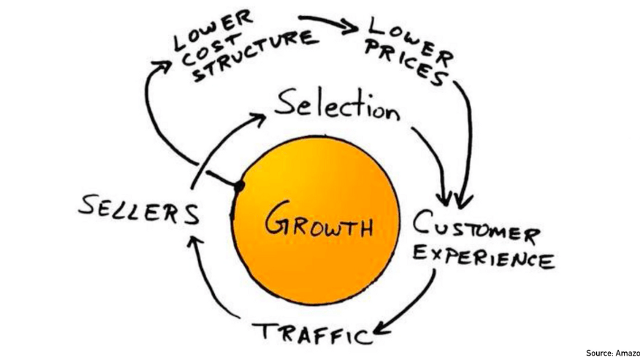 Greater selection attracts more customers, and so on, setting the ‘virtuous cycle’ in motion at Amazon. And most importantly, when you optimize any part of the Amazon flywheel, it pushes the other components forward, accelerating the entire loop. One of the biggest advantages of the Amazon flywheel is its ability to create compound effects; the synergies created between the individual parts of the flywheel that work together to keep the flywheel spinning. As a seller, you need to figure out how you can create synergies in your Amazon business to achieve similar compound effects. An obvious example is to look at the relationship between your organic rankings on Amazon, the performance of your Amazon PPC ads, and your overall profit. On Amazon, your organic ranking is strongly influenced by your sales velocity. Simply put, more sales = higher rankings. Higher rankings will lead to more sales, which in turn will boost your organic rankings, leading to more sales and so forth. To accelerate your organic sales growth, you can introduce Amazon advertising to the mix. Additional sales generated via Amazon PPC ads will help to improve your organic rankings; meaning your advertising sales will also have a positive effect on your organic sales. If you reinvest the profit generated from your organic sales back into Amazon advertising, you will again drive additional sales growth, leading to higher organic rankings, higher organic sales, and so forth, setting your seller flywheel in motion. Similar to the Amazon flywheel, your SEO and PPC efforts on Amazon both support and create momentum for each other, helping you to achieve more overall profit. But what happens if your search rankings drop on Amazon? If your organic rankings drop on Amazon, your sales will also drop. Less revenue generated from organic sales will also impact how much you can afford to spend on Amazon advertising. A simple reason as to why your rankings dropped might be that your competitor’s sales volume has spiked in the past month. If you can track your competitor’s daily sales volume, and compare it against your own, you can evaluate if this was the case. If your PPC sales make up a substantial bulk of your overall sales, a drop in your PPC sales will also negatively impact your organic rankings and sales. Here, you will want to focus on optimizing your PPC campaigns (keyword research, CPC bid optimization, etc), to improve the sales performance of your ad campaigns. Of course, you can only determine where and when to take action if the KPIs for your key growth channels (SEO + PPC) are accessible and synced across all channels of your Amazon operations. In order to create synergies between the different aspects of your business, you need to understand how, and to what degree, each aspect of your business inform and impact the performance of the others. This was also our understanding when we developed our “All-in-One” software approach at Sellics. We saw that all the different parts of a seller’s activities on Amazon would be interrelated, and to maximize your sales performance, you would need data insights and tool support across all your business activities on Amazon. In Sellics, you can easily track your keyword rankings, and see if your Amazon listing optimization efforts have had a positive effect on your rankings and BSR. You can also see your exact profit generated from Amazon PPC, allowing you to determine if you can afford to spend more on advertising to accelerate your paid sales and organic sales growth. 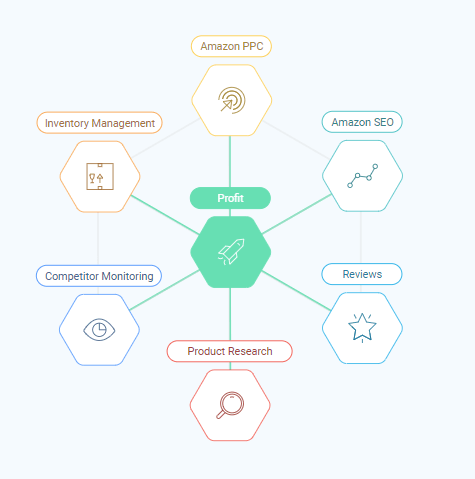 Finally, by adding new initiatives such as competitor sales monitoring to your business, you will be equipped with better business insights that will help support and sustain the momentum of your SEO and PPC efforts on Amazon. Just as Amazon quickly found new businesses (FBA, Prime, AWS) that served to accelerate their flywheel momentum, you can achieve the same by identifying new growth initiatives in your Amazon business that will enable you to reap the financial rewards of strategic compounding.